Since personal style choices differ and life styles evolve as well as change, it is impossible for manufacturers of coaches, travel trailers, or other recreational vehicle to design factory models to fit individual preferences. Remodeling an RV can make the difference to make the travel experience a pleasure for everyone. Planning the remodeling with RV Outfitters allows for individual preferences in improvements and décor changes that upgrades will bring. The first step is making a master plan. Careful planning allows alterations that can grow with a family. Changes can be made all at once or over a period of several different stages. Personal preferences for the use of storage space with custom cabinetry and alterations in furnishings for individual needs allow individual choices to drive the efficiency as well as use of the available space. Consider how alterations to RV furniture, TV viewing areas, and a computer office area need to dovetail with cooking, hobbies, and entertaining. Addressing ‘first things first’ gets the RV space functioning for individual family needs. With the age of digital photos comes the ease of documenting the ideas seen in the RVs of friends that appeal to each. Collect photos as well as ideas found in advertisements. These will create a portfolio to take in that could include drawings and sketches, as well as these pictures, to RV Outfitters to convey a visual concept of your ideas. Next, quality work and materials used in projects will add improvements and beauty to enhance the initial investment of the coach or travel trailer. Comfort and ease in functional ability can be an asset when custom cabinetry adds upgrades to create luxury for daily living. Less crisscrossing common space to complete a task will allow two or more individuals to enjoy projects with ease! 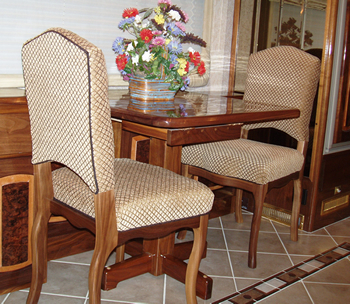 RV Outfitters have the experts to work with owners to plan and customize for personal space. Adding quality materials might mean reupholstering with leather a sofa or chairs to add beauty and functionality. Girard automated awnings can add ease in adjusting for sun angles or beautiful vistas. Upgrades to bathrooms can help families so that individual use doesn’t prevent other family members’ needs to be neglected. Well placed lavatories permit separation of showering and toiletry to prevent bathing or the application of sunscreen or make-up from dominating a single use space. With the optimization of all available space and the organization of flow patterns for tasks designed, upgrades can help maximize lighting, beauty, and function of the existing coach, motor home, or travel trailer. After flow patterns, the pleasure of granite countertops, ceramic tile or hardwood floors, style changes in faucets and fixture can round out a personalized list. All this helps to get more out of the initial investment for your individualized pleasure and road trips.